Here comes another freebie. This time from Iolo Technologies best known for its do-all System Mechanic utility suite, which includes security protection and various other system-maintenance features. The new System Shield 3 Internet Security lets the security protection modules stand on their own, without the other various utilities. iolo AntiVirusâ„¢Detect, block, and remove viruses, rootkits, worms, trojans, and other dangerous programs with always-on protection. iolo Personal Firewallâ„¢Block unwanted communication to and from your PC, keeping your private information safe from hackers and identity thieves. Spythonâ„¢ AntiSpywareRemove spyware parasites to protect your privacy and prevent system crashes and slow-downs. Security Optimizerâ„¢Repair dangerous security vulnerabilities that would otherwise leave your system open to attacks by intruders and data thieves. SystemGuardâ„¢Lock down your system configuration to prevent unauthorized changes by spyware, viruses, malicious Web sites, and remote attackers. As per the review done by PCMag, it got the following pro and cons. Firewall has separate settings for Internet zone and trusted zone. Security Optimizer finds and fixes vulnerable system settings. Firewall resists malware-style attacks. Firewall leaves significant ports unstealthed. Spyware scan did a very poor job. AV incorrectly claimed to delete many threats. AV erroneously killed RootkitRevealer, calling it a Trojan horse. To grab the free license, follow these steps. Access This Promotional Page and click on continue button. A next page with Iolo shopping card with be displayed and product price of $49.95 will be reduced to $0.00. Now Click on Secure Checkout. Fill out the form with all required details and click on Review Order and then press submit button. A license key will be mailed to you to the email address you provided during the process. Use this key to activate the System Shield. 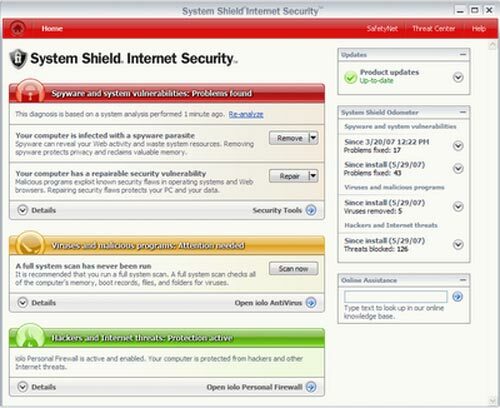 You can download setup file of iolo System Shield 3 Internet Security from here.